My Sweet Raised Cinnamon Rolls are light and delicious! Warm up the family quickly with a little lovin’ from your oven! 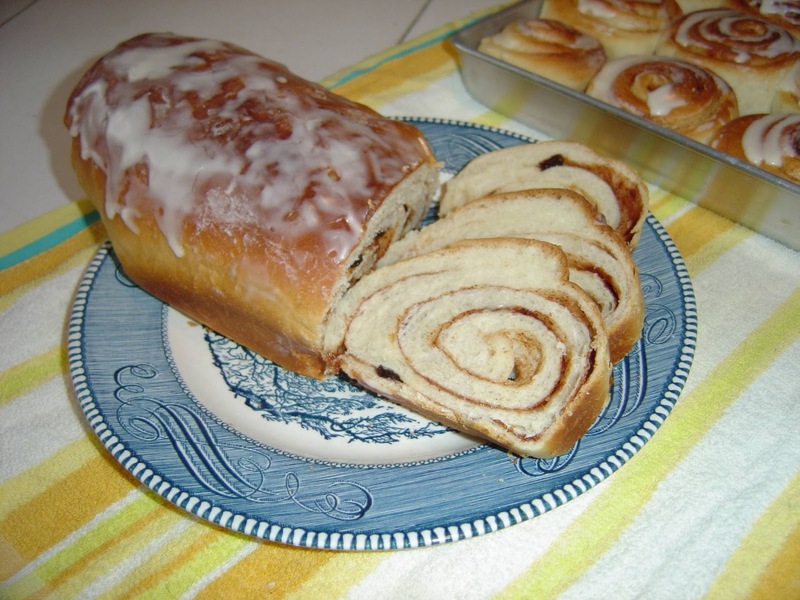 Today, I have my favorite recipe for making delicious, homemade cinnamon rolls and raisin bread from the same sweet raised dough. You’ll never miss those bakery shop ones again once you make a batch of my favorite sweet raised cinnamon rolls. Trust me, you’ll be nuts for this recipe just like I am! Test the water on the back of your wrist for the temperature. You want slightly warm water, but not hot like you would do for testing a baby bottle. When the temperature feels right, add the teaspoon of sugar to your water and yeast. The sugar will help the yeast to grow and bubble faster. Add 7 cups of the sifted flour with all the remaining ingredients in a large mixing bowl. Mix and add the last cup of flour gradually until the dough doesn’t feel sticky. When it feels like the right consistency, take it to a floured surface and knead until it forms a soft dough ball. Place in a greased bowl and cover. Let it rise near a warm spot until doubled (about 1-1/2 to 2 hours). Punch down, then divide into three balls. Let rest 15 minutes more before rolling each piece on a lightly floured surface. 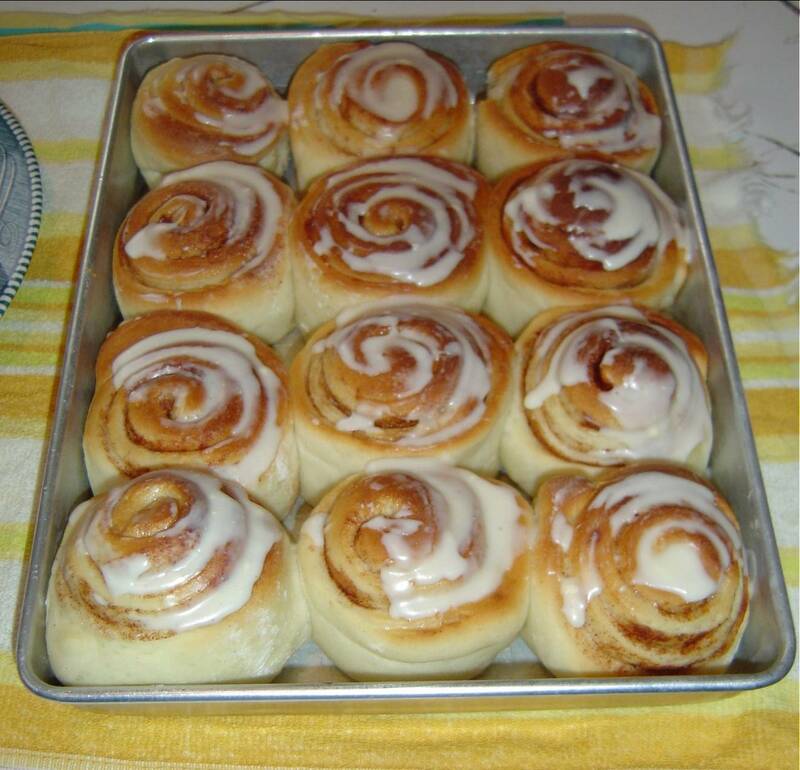 Grease two loaf pans (9″ x 5″) and one small cake pan (11-1/2″ x 8-1/2″) or you can make all cinnamon rolls or two giant raisin breads (use a cookie sheet). My secret is brushing the rolled dough lightly with water–not oil or butter! Then sprinkle the sugar and cinnamon before rolling up, beginning with the narrow side. Pinch together so nothing leaks out, then place the seam side down on the greased pan. Roll out the same way for cinnamon rolls but this time skip the raisins. Shape the roll and then slice into pieces. When I make the two loaves and small cake pan of rolls, I get 12 rolls. Let them rise and double for about 45-60 minutes. No one can resist overindulging when I bake these. Bake at 375 degrees for about 35 minutes or until lightly browned. Drizzle my Simple Glaze Nuts Style on your cooled rolls and bread. Put everything together in your mixing bowl and beat until it’s the spreading consistency you like. If you want a thinner glaze fpr the Sweet Raised Cinnamon Rolls, add a bit more milk. When rolls and bread are cool just drizzle the glaze on. Raisin bread is just as yummy from my sweet roll dough. Oh my!! I have to give your recipe a try very soon! 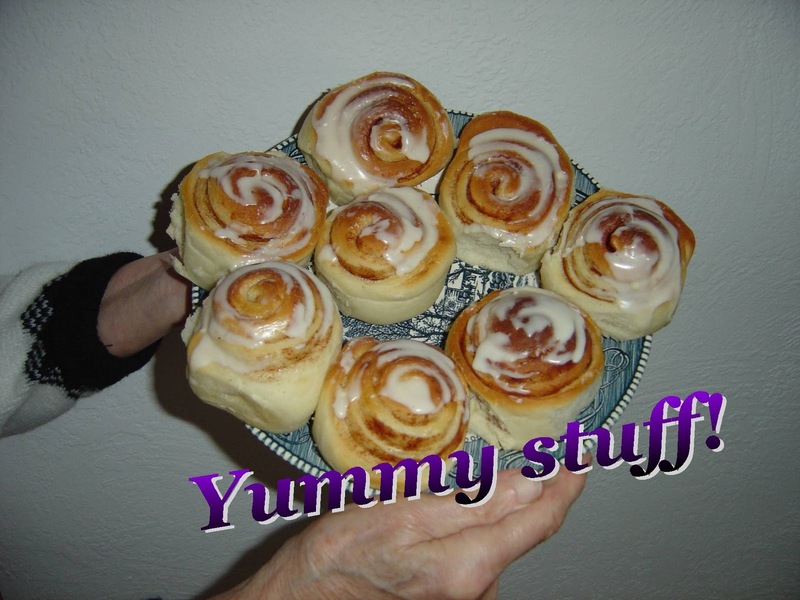 My husband simply LOVES cinnamon rolls and yours look delicious!Thank you for the recipe!